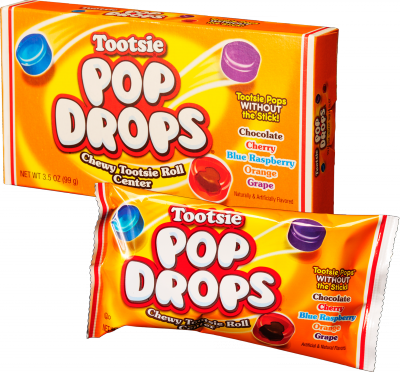 For stickless enjoyment of the classic taste and fun of Tootsie Pops, Tootsie Pop Drops offer bite-sized assortments of five great Tootsie Pop flavors—Chocolate, Cherry, Blue Raspberry, Orange, and Grape. They’re perfect for home, work, the car, or anywhere you go—the totable Tootsie Pop treat without the stick! 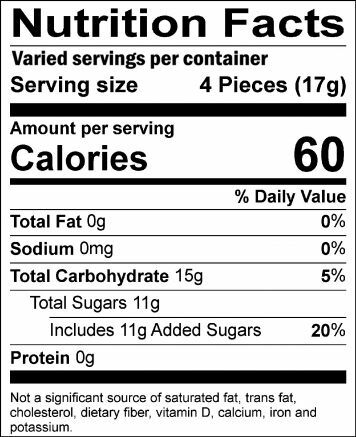 Ingredients: Sugar, Corn Syrup, Palm Oil, Citric Acid, Condensed Skim Milk, Cocoa, Whey, Artificial And Natural Flavors, Soy Lecithin, Artificial Colors (Including FD&C Red 40, Blue 1), Turmeric Coloring. Safety Warning: Hard candies can be slippery and cause choking - especially in children.